It’s that time of year again when I start to recognize that I have a lot of things to get rid of. It is pretty common for me to feel this way at least once per year, especially when spring is soon approaching. 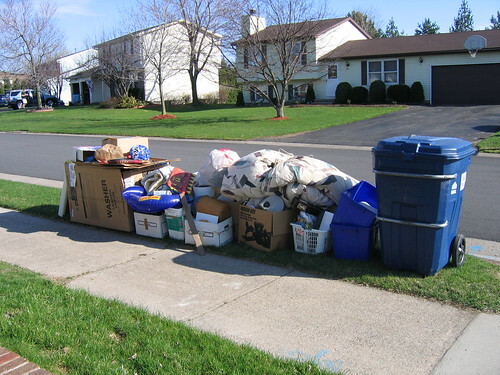 I am sure many of you agree that it feels good to clear your home of all the items that you have held onto for months, even years, and just get rid of them. Many refer to it this as spring cleaning, which is a simple way of saying that you are encountering an organizing enterprise! (Sounds much more complicated wording it that way, doesn’t it?) No matter what you call it, it’s still a time to get rid of old stuff that serves no good purpose whatsoever. So what will I be getting rid of this year? Well, there will be the sweater that shrunk when I accidentally placed it in the dryer, the snow sled that my children enjoyed for years, numerous kids toys and books that I found in my attic, and an old size-24 winter coat that I have held onto since 2002. Why have I kept the coat? I guess because I just didn’t want to get rid of it; I really don’t have a legitimate reason. But I am finally getting rid of that old coat! I have accepted that I don’t need it anymore. Which brings up a thought: Just like that old winter coat, we all hang onto old things we should be getting rid of, things such as old behaviors. More specifically, old, bad behaviors that serve no good purpose whatsoever. Most likely you do not like these old, bad behaviors and so you do what I do with my old stuff: get rid of it! Say goodbye to those old, bad behaviors that you’ve been holding onto and accept that you don’t need them anymore! Yes, it is time to bid them farewell because you’re doing some self spring-cleaning in 2012. And for those of you that would like a little help, I am here for you. My suggestion is for you to find a box. Throw out those “bad behaviors,” seal up the container, and send them on their way… forever! Your old stretch pants — yes, it’s time to get rid of those too. It time to focus on behaviors such as a healthy lifestyle changes, making no excuses, having a positive attitude, exercising daily, getting a good night’s sleep and more. These behaviors will especially help you get rid of those old stretch pants because they will eventually become too big for you to wear. It CAN happen. It did for me and it can for you just as well. Now, go find a box.